Please select the shape that is most similar to your current room configuration using the images in the upper panel. A rectangular shape is the easiest to start with, as It offers automatic border placement and medallion centering. It is selected by default. Select the base material for your project on upper-left panel by clicking on either the "Wood" or "Stone" radio buttons. Adjust the dimensions and shape by dragging anchors circles. Click "Next" button to proceed to the next step - selecting a parquet or tile background. Select a parquet/tile design from the upper-right panel by clicking on a thumbnail. You may scroll through the panel to see all available styles. Select the appropriate base material on the upper-left panel to choose between stone tiles or wood parquet. Parquet is typically supplied as pre-assembled square modules for glue-down application. An exception is herringbone parquet, which is supplied as individual pre-cut pieces. You may choose a parquet/tile size if multiple sizes are available for this model. You may select a direction in which tiles or parquet can be installed. Adjust the placement of the tiles or parquet for better fit your room. Size: 36x36 48x48 60x60 72x72 in. Select a medallion design from the upper-right panel by clicking on the thumbnail. Scroll through the panel to see all of the available styles. Medallions are typically single-piece inlays placed in the floor to create a "focal" point in the room. They come in variety of sizes, shapes and styles. You may choose one of the standard sizes from the drop-down list or check "Shape Customizing option" for free-form shape, size and placement adjustments. We recommend selecting a size that is about 1/3 of the room�s smallest dimension. The size of the medallion can also depend upon your use of borders and their distance from the wall. Use the "Orientation" slider to rotate the medallion. 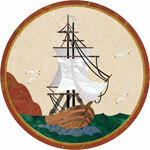 This is useful for oval medallions or "Nautical" designs. For a rectangular shaped room, this application automatically centers the medallion, but you can override the placement to fit your needs. Select a Border design from the images on the upper-right panel by clicking on a thumbnail. Scroll through the panel to see all the available styles. Borders are long, rectangular inlay sections that can be used to define a specific area. Borders are placed around an area, such as an island or room, running parallel to the walls. Borders are typically placed about 12 inches from the wall. Some borders come with special corner blocks. Others are mitered on site(shown in the floorplan as overlapping in the corners). If you selected a rectangular room in Step 1, borders are automatically placed around the perimeter. For other shapes, use the "Add Border" button to manually place border sections around the room. Select an Apron style from the selections on top by clicking on an image. An Apron is an area between the border and the walls. It can be filled with standard floor plank or you may leave parquet or tile installed "wall-to-wall." It is an optional step and a matter of taste. Planks can be installed along the walls or at 90° to the wall, creating a "wooden rug" appearance. Apron width is typically about one foot. You may adjust the apron width by navigating back to the Border section and changing the border distance to the wall. *Quantities include extra material using the selected waste factor. Prices shown may not be current and for guidance only.